This blog examines City Colleges of Chicago tuition rate changes for in-district, out-of-district and out-of-state tuition rates per semester hour over a ten year period. This blog also compares City Colleges of Chicago in-district tuition rates with the in-district rates of 10 selected regional community colleges in northeastern Illinois. In FY2016 City Colleges transitioned from a per-credit hour tuition and fee based revenue structure to a tier-based cost of attendance model. This new model includes tuition and mandatory fees based on a student’s part-time or full-time enrollment status. Beginning in FY2016 and continuing in FY2017, the flat rate charge for in-district enrollment is $599 for one course (one to four credit hours), $1,069 for part-time enrollment (five to 11 credit hours) and $1,753 for full-time enrollment (12+ credit hours). The current tiered tuition structure is designed to encourage full-time enrollment and timely graduation, make cost of attendance more transparent for students and simplify the revenue structure. The following table shows the City Colleges tuition changes that have occurred over the past ten years. Between 2007 and 2012 the in-district tuition per credit hour increased gradually by $17, or 23.6%. Tuition remained flat at $89 per credit hour for in-district residents from 2012-2015, followed by the tuition structure change in FY2016. The proposed tuition structure in FY2017 will remain flat from the prior year. Before the FY2016 tuition structure change took place, City Colleges’ per credit hour tuition was the second lowest of eleven selected community college districts in the northeastern Illinois area. Following the tuition structure change, the cost of in-district tuition and mandatory fees at City Colleges compared to other community colleges varies based on the number of credit hours taken. City Colleges’ in-district tuition rates and mandatory fees remain the lowest among area community colleges for part-time students taking at least nine credit hours and for full-time students taking at least 15 credit hours. However, City Colleges’ tuition rate for a student taking one class is among the highest compared to the other selected community colleges. 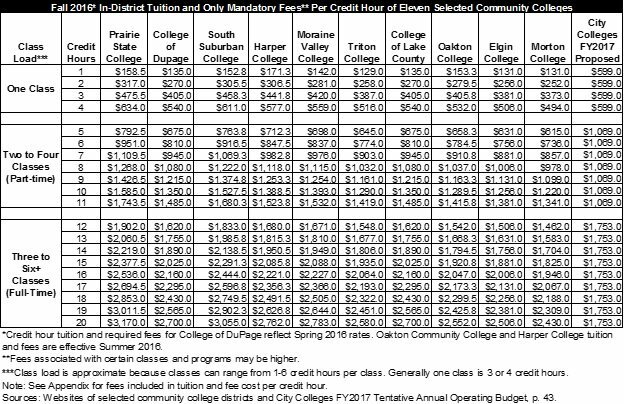 The following table compares City Colleges’ FY2017 tiered flat rate tuition to the ten other selected northeastern Illinois community colleges by credit hour. Full-time students taking 12 credit hours or more currently pay $1,753 per semester, part-time students taking two classes or more, up to a total of 11 credit hours, pay a flat rate of $1,069 per semester and students taking only one class pay a flat rate of $599 per semester. The result of the new tuition structure is that students enrolled in fewer credit hours within each class load classification (one class, part-time, or full-time) will have a disproportionately higher tuition cost than that of other community colleges. Under the current tuition structure, a student enrolled in one class totaling three credit hours at City Colleges with only mandatory fees, will pay $599, which is a tuition increase of $252, or 72.6%, over the FY2015 budgeted tuition and fees, which makes City Colleges the most expensive community college in the region for a three credit hour class. The City Colleges $1,069 in-district part-time rate is the least expensive among the eleven selected community colleges if a student enrolls in 9-11 credit hours, but it is the highest if a student enrolls in 5-7 credit hours. At 8 credit hours, City Colleges is the fifth least expensive of the 11 community colleges. A part-time in-district student taking two classes that total six credit hours with only mandatory fees is now paying $455 more, or a 74.1% increase over FY2015 tuition and fee rates. The $1,753 in-district full-time rate makes City Colleges one of the most expensive community colleges in the region if a student enrolls in 12 credit hours, but the least expensive if a student enrolls in 15 or more credit hours. A full-time in-district student enrolled in classes totaling 12 credit hours with only mandatory fees will pay $485, or 38.2% more than in FY2015. However, City Colleges remains one of the lowest cost community colleges for full-time students who enroll in 14 credit hours or more. City Colleges of Chicago FY2016 Tentative Annual Operating Budget, p. ii. City Colleges of Chicago FY2017 Tentative Annual Operating Budget, p. 357. For more information about included mandatory fees, see the Appendix on p. 48 of the Civic Federation’s Analysis of City Colleges of Chicago FY2017 Tentative Budget, https://www.civicfed.org/sites/default/files/REPORT_CityCollegesFY2017Budget.pdf . 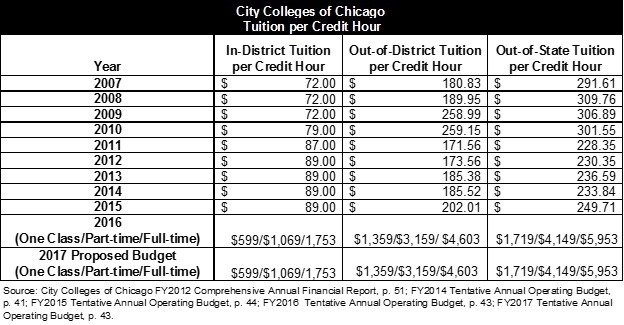 City Colleges of Chicago bases its analysis on the cost from a Chicago student perspective and thus compares in-district to out-of-district tuition and fee rates in the FY2017 tentative budget. The Civic Federation instead compares in-district to in-district to gain a better understanding of the cost of enrollment among community colleges on a regional basis.